Hi! Do you have any questions about keyword shortcuts? 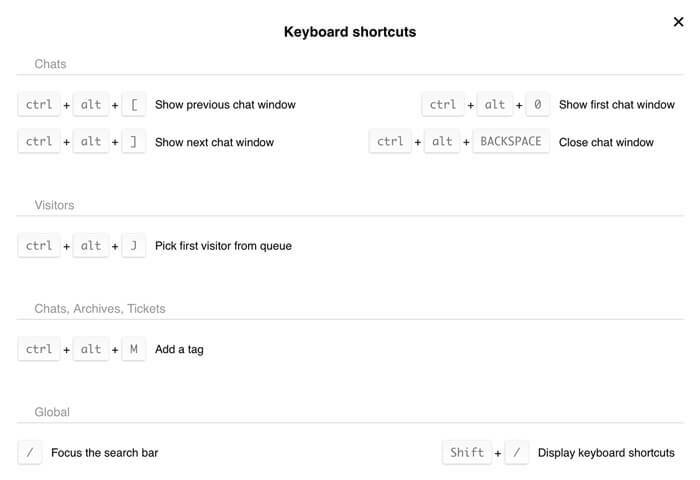 You can make your chatting a lot quicker by using a set of LiveChat keyboard shortcuts. Using these shortcuts, you will be able to quickly jump between chats, open different parts of the application and generally make your job much easier. The list is also available in the app, in the Keyboard shortcuts section. ‘Pick first visitor from queue’ shortcut works regardless of the concurrent chat limit defined in agent’s settings. Even if agent is handling as many chats as set up in their settings, after hitting ctrl + alt + J or ctrl + ⌥ + J the extra chat picked up from the queue will be routed to them. Learn more about using shortcuts from an article on our blog.